Published: Jan. 24, 2014 at 05:04 p.m. Updated: Jan. 25, 2014 at 03:28 p.m. It appears the Denver Broncos will get a full helping of Percy Harvin in Super Bowl XLVIII. Seattle Seahawks coach Pete Carroll said Harvin will "do everything we want him to do" next Sunday, according to KJR-AM. Barring a setback, Harvin will return kicks in addition to his wide receiver duties against Denver. Harvin missed 15 of 16 regular-season games as he recovered from hip surgery, then was held out of the NFC Championship Game after suffering a concussion in Seattle's divisional-round win over the New Orleans Saints. On Thursday, the Seahawks confirmed to NFL Media that Harvin passed his concussion protocol and has been cleared for game action. He practiced without restrictions all week. "That's a dangerous man right there," Broncos cornerback Champ Bailey said Friday. "He can change the game if you allow him to. "I don't know how they're going to use him. We don't have a lot of tape on him -- if any. But they're going to use him. You don't have a weapon like that and not use him." Seahawks running back Marshawn Lynch and wide receiver Doug Baldwin were both held out of practice Friday as a precautionary measure. 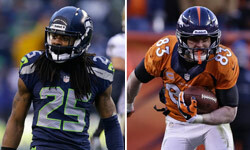 "Just getting back from the game both guys got banged a little bit," Carroll told KJR (via ProFootballTalk). "They'll both be fine, probable to play and all that. But they're more than that, they're going to go. They'll be fine."